I am finally back in my ‘writing’ persona, at last! It is quite difficult when you find that you have written quite an epic article recently, it certainly gives you that high of accomplishment but at the same time you kind of get stressed as to where to find the next ‘push’ to nail that next article, one-after-the-other. But here I am in from of my laptop typing away so hopefully I will have that spontaneous thinking and typing, at the same time. So tonight I will talk more about my eczema but with huge reference to the precursor – Leaky Gut- as per my ever favourite reference book: The Food Intolerance Bible. But of course my blog or article will be interspersed with various information sourced from many different sources from my own research. What is food intolerance and food allergy? As per the book, it is defined as a reaction of the body’s immune system due to some foods that are not suitable for the person but the effect is not immediate as compared to that of Food Allergy where it can be immediate and life-threatening. If a person has food intolerance, this can greatly affect his daily lifestyle such as the stress of having to choose from a very limited food choices which can be very frustrating especially if one is used to going out once or twice a week to indulge in restaurants and also having to miss birthday invitations and other gatherings involving feasting on a lot of dishes. Another definition is from the Allergy UK Organisation that says, food intolerance or food hypersensitivity, usually the symptoms can go on for a long period of time, in short, delayed. It also mentioned that some symptoms are joint pains, diorrhea, dark circles under the eyes, eczema, among others. My eczema is mainly on both arms although I have one small patch on my left thigh near the knee. Each day is a struggle especially before showering that is when I itch, I do not know why this happens, and mostly severe itching after I have showered so what I do is towel dry my skin and battle the urge to scratch my skin by rubbing the towel against it then close my eyes as I apply the Calendula cream on both arms in a very quick manner and then I sit on my chair and calm myself down…as the pricky and stingy feeling just is out of this world.. There are days where I find that the patches flatten but some days I also get frustrated because the red circles appear agressive or very much red and bumpy. In these moments I get really flustered at my efforts to topple this skin problem but here we go, human limitations — just have to keep on hoping that every day is a new day, a new day to heal such condition. Leaky gut is when the intestinal tract lining are inflamed due to being ravaged by toxins from eating ‘unsuitable’ foods like wheat, gluten, and even sugar, most especially. As the person continues to eat foods that are high in sugar or cakes and pastries which are high in sugar too, plus loaded with wheat and gluten – which are obviously acidic foods – then the body gets too acidic which then creates inflammation in the digestive system. In addition, there is a good point stated by Livestrong.com, it says that two-thirds of our immune system is confined in the small intestine. Wow! This makes sense! This is why a damage of this part of our body can be really detrimental to our health as this is quite a big chunk of our defence system, two-thirds! A leaky gut happens because the the intestinal is now ‘permeable’ instead of it being ‘impermeable’ to food particles and toxins that can harm the system like the bloodstream. If food is not digested well by a weak digestive system, toxins can penetrate past the intestinal tract lining, then the body’s immune system gets alerted which then tends to release its ‘defence army’ to suppress the attack, by way of releasing histamines. 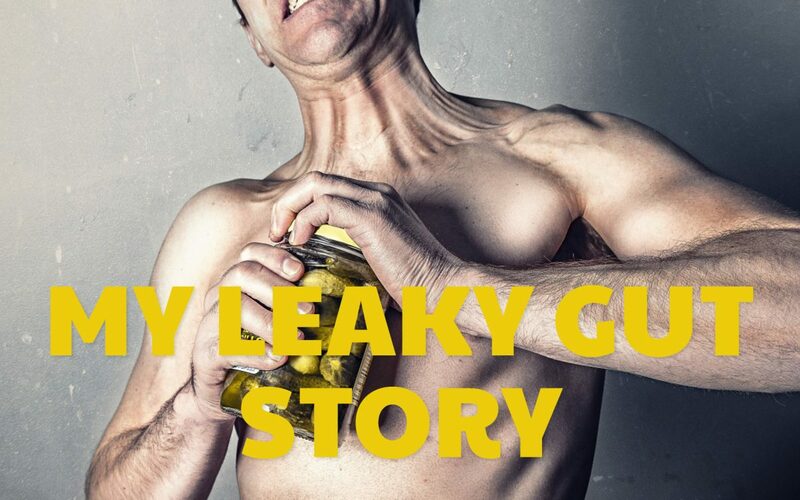 I was reading the other day about an article in one of the health blogs that talked about leaky gut. It mentioned there that when you have a leaky gut you start to be ‘allergic’ all of a suddent to most foods like certain vegetables that you were never intolerant or reactive in the past. In this situation, you then get reactions like palpitations of the heart. I figured that this makes sense because a few days ago I had palpitations throughout the night after I had eaten a particular salad leaves called: chards. It is quite baffling to me, makes me more paranoid too, why I was reacting to just a vegetable which to me is really healthy, and it is not as if I was eating prawns which, I am lethally allergic to. I can now understand why I get palpitations when I eat certain foods, this must be because the body system is under attack, in other words, inflammation is happening, therefore the body’s on alert and agressively sending out its natural coping mechanism to defend the body as a whole. It is a know fact that eczema is a severe skin rash which is quite irritatingly itchy! (And this is what is happening to me these days). Eczema, therefore, is a result of the body’s way of unloading or eliminating toxins that are harmful to the body as a whole. In fact, the proof of this is when the body has accumulated a lot of toxins, which makes the blood acidic, it gets rid of these toxins via our biggest organ – the skin – and this now shows up when one has skin rashes like psoriasis, and eczema, it is literally your’e body crying out in pain to let you know that it is overloaded with toxins which is poisoning your bloodstream if not eliminated. In the book, The Food Intolerance Bible, it is really established that Leaky Gut is the cause of eczema. It also, again, emphasised that continued aggravation of attack of the mucosal lining by eating bad foods containing wheat, gluten, and other acidic foods, can put a ‘gap’ in this part of our body. And again because the gut is now damaged, it is now then in a state of ‘increased permeability’ which paves the way for an overgrowth of bad bacteria and parasites from the undigested food particles. This then creates imbalance or inflammation and a state of chaos where the body has to find a way to expel the toxins to restore the ‘equilibrium’ – hence it manifests in the skin, that is what we call as ECZEMA. My daily diet is not much really in terms of choices. I have started to buy mostly salad leaves for my meals like watercress, ideally organic, from the local supermarket. With the salad leaves I sprinkle Extra Virgin Olive Oil on it to make it appetising. I also squeeze a tiny bit of lemon juice and sprinkle some Himalayan Pink salts and I also add some stir fried celery cuts, about an inch. Every day I am loading Extra Virgin Coconut Oil in stir frying my vegetables along with rice noodles which I also cook with this oil. I know rice flour is not ideal but to be honest, I still eat it and mix with my salad leaves, so far it is doing me good. This compensates my craving for meat which I used to eat with my rice and vegetables. I am really convinced that incorporating Virgin Coconut Oil in my diet is very beneficial. Why? Coconut oil is loaded with lauric acid which is claimed to kill off some viruses and bacteria, this according to one great article from the site Organic Facts.net. It is also claimed to be good for the immune system and helps with the digestive system due to its saturated fats content which has anti-microbial properties. I just got this superior brand of Extra Virgin Coconut oil by Lucy Bee, a few hours ago (January 19, 2015, to be exact). This brand has lots of positives about it. It has a very good website which is very pleasing to the eye. The product is ethically sourced as it is Fairtrade certified so that shows that this brand cares about the lowly people behind the harvesting and making of it. Plus this brand boasts of raw and organic variety of coconut oil, non GMO, and no additives. I also want to add that they are prompt in communicating or answerin emails. To add to that, this brand has garnered an impressive 641 reviews by customers on Amazon.co.uk so that really says it all. You must try it as when I used it, this is the only virgin coconut oil that I have used that emitted a nutty and almost the same smell or aroma from the coconut milk that I used to have back in Asia, smelled divine. So far the recent one I used before this did not have this surprising and distinctive ‘coconutty’ kind of aroma. You can bank on this claim. Trust me. I firmly believe that one must AVOID the ‘Nightshade Family’ vegetables and fruits like tomatoes, cucumber, potatoes, egggplant, berries (strawberries, to be exact). I truly agree with this as this has been pointed by my homeopath that I was seeing back in the year 2011, it helped a lot. I must also add that everytime I eat spaghetti bolognese, I get really ‘warm’ all over my body especially around my face area. I have also been avoiding eating lentils as this was, I believe, one of the biggest culprit why my skin erupted very seriously a few weeks ago. I was eating it most days as part of my vegetarian diet as I was trying to get off eating too much meat which was acidic, but then it was too late to find out that lentils has high uric acid content. What a sad decision as I really liked it, the aroma it gave my meals, it was super appetising for a usually bland vegetable-based dishes. These days I have eliminated eating chunky chips or french fries from McDonalds or KFC, burgers and onion rings which are loaded with wheat (bun, batter) and plus the fact that it is best to avoid starchy food when you have skin allergies. In addition, I have stopped dipping into mayonnaise which is quite bad due to egg content. No more butter, no cakes or pastries for me, for this time, but I do not know how long I can hold on to this diet. No soy sauce for cooking, or even soy as a whole, needs to be avoided. No MSG related food items from sauces and condiments. No eggs and dairy and cow’s milk products as I believe with all my firmness – eggs are bad for eczema! I have also stopped consuming rice, pasta, tuna – canned or whole fish, pork, chicken (although you can eat fish like salmon, it should preferably be ‘wild’ not farmed due to chemicals or hormones). I also have to mention that before my skin erupted with weeping eczema skin condition, I was eating constantly, every single day, 2 or 3 apples (basic ones) which are treated with chemicals or pesticides for these to be presentable to the consumers. In fact, according to a report by the Huffington Post, apples again, topped the Top 12 Most Pesticide-Heavy Fruits and Vegetables of 2014! Apples are also deemed high in naturally occuring plant chemicals too called salicylates, which according to Allergy UK Organisation, one can develop salicylate sensitivity if this is being consumed in huge amounts but it varies with an individual’s tolerance level, some react even with low consumption while others react if the consumption is high. This could be one of the biggest triggers that led to my skin breakouts. Equally bad are potatoes, which a few years ago, I stumbled on an article that exposed how potatoes are treated with chemicals so they look presentable and pleasing to the eye – the consumers. Plus it is also said that it is best not to consume vegetables that are starchy in nature. I also believe that there is a truth to some claims that one must never eat fruits after a meal as this will just sit on top of the consumed meal which will then ferment in our stomach which can cause a lot problems due to poor digestion that ensues. Processed foods like ham, hotdogs, bacon, sausages. These contain a lot of artificial ingredients that are loaded with preservatives and additives. The biggest question is How to Repair a Leaky Gut. This is quite extensive but I will try and write as much and put together the facts I have read from various sources. Elimination Diet – this simply entails trying to avoid certain foods that you feel makes you ill after eating it, and in avoiding these foods you then can gauge if there is a difference in your allergies or skin conditions i.e., symptoms worsen or improve. This might be best done along with a professional consultation from a nutritionist of dietitian so you can make sure that you are not overdoing the process and you end up with minimal nutrition which can then give rise to other health issues. This is what I am currently doing as far as myself is concerned. I have given up on my addiction with doughnuts and sweet things. I also stopped consuming red meat like pork and beef as well as cakes and pastries. I also think that it is a wise move for me to stop eating processed foods, starchy vegetables or root crops like sweet potatoes and the regular potatoes. Tackling stress can seem complicated but it in the long run it will pay off in many aspects. I believe that stress is the number one trigger for many of our ailments in the premise that once you are constantly stressed out you then go into physical imbalance, that is, physical symptoms manifest as your immune system gets challenged. In this connection, de-stressing will really help you bring back that focus of self-calm amidst all the chaos going in your body and in your mind. The good news is that there are many ways to bring your stress levels down. You can definitely do the free route like walking in the forests or parks while listening to a Zen spa kind of tune or something like the Mozart as opposed to playing a fast and rowdy music that will just add up to your already stirred mental and physical condition. You can also try to do some deep inhale and exhale breathing activity in order to collect yourself and also satiate your body’s need for oxygen. One can also do some yoga or group exercise activities where you will be able to socialise and divert your mind from the ‘itchy’ skin affliction. Right now I hav a few supplements that I am trying out to see how these will bring out the best in my HEALING. I have decided not to seek to use the mainstream medicines as I don’t want to get involved with steroids and other nasty ingredients that can cause more havoc than help. Again, just a personal choice of mine considering the fact that I am an avid fan of herbal remedies and the like. According to Livestrong.com’s article, Glutamine is an amino acid that is heavily consumed by the cells to manufacture proteins. In the case of leaky gut syndrome, the structure named as ‘tight junctions’ (they seal the series of cells that keep the cells together and prevent toxins from going into the bloodstream) are disturbed due to inflammation. So without this amino acid, the body will struggle to heal the gut. This is why L-Glutamine is really essential for gut healing as the cells in the intestinal lining burn this for fuel to make possible the repair process of the gut. If you want to grab a good quality L-Glutamine powder that helps to support digestive tract tissue integrity and helps to protect against Leaky Gut syndrome, do not delay – get yourself one!! Click Here!! I have chosen this variety from Mountain Fresh as it is non-alcoholic so I guess it is a better option for me. The brand seems to evoke a good feeling about it and when I asked them questions, they were very prompt and helpful – and that helps one to decide to give it a try. The good points: 100% natural – herbs, barks – nothing added, wild crafted, non GMO. According to Liver Support.com, milk thistle as a powerhouse of antioxidants, may protect the liver cells from damage wrought by free radicals by blocking the entry of harmful toxins into the liver cells and at the same time it can dislodge these toxins out of the liver cells too. This I have been taking since year 2011 but it is quite on and off. The last time I was on it consistently was May 2014 and then because of my eczema comeback, I now take this every day, after meal. This ever important supplement is quite beneficial as it repopulate the disrupted gut flora which is now in a state of imbalance as with reference to eczema and leaky gut conditions. This is commonly termed as ‘friendly’ bacteria. If you were to consume this via natural source then the best way is to go for Yogurt with probio in it. And this one I strongly believe is crucial to healing the gut and eczema, as recommended by my homeopath. You can buy from one of the highest quality kind of Probiotics from Higher Nature as they are know for their Best Quality ingredients as I have been told by at least two therapists that I have met so far as compared to a national brand that I would rather not mention out of respect. From my skimming and browsing online, I have read that we need to bring our water intake to a certain ph in order for it to be alkaline. Alkaline ph is said to benefit our body from being too acidic, and a body which is too acidic can be a start of different health issues. Plus our drinking water from the tap can be a source of different contaminants that are resistant to the filtration and treatment before the water is made available to the general public for consumption, but of course the water is safe for human consumption, just a matter of personal choice if you want to be sure that you are drinking the best and the safest water quality for your drinking needs and the whole family. Have a look at this article by The Daily Mail UK about how tap water can be unsafe for pregnant women as it doubles the risk of birth defects. Click here…. Jumbo 3.5L Water Cleaning and Alkaline Jug by Optimised Energetics – this one says that it is BPA free, takes only 10 minutes to produce alkaline water, with 3 filters which is a good 6 months filtration. Has an excellent rating of almost 5 stars! PureAire Alkaline Water Jug – claims to filter out chlorine and other contaminants, permanently absorbs metals such as lead and copper and reduces limescale. This jug has 39 customer reviews as of this writing and rated with 4 stars. This product has an impressive 76 customers reviews on Amazon UK as of this writing, that says a lot in terms of buying confidence. Ingredients wise, it has the ever popular coconut oil that is soothing and natural and bergamot oil, and contains true 80% colloidal silver. It is recommended for various skin conditions affected by bacteria and fungi including psoriasis which is related to eczema. – this products says it uses Ceramet ceramics and can remove an impressive rate of 99% chlorine and impurities and inhibits bacterial presence plus it reduces heavy metals and scale. Replacement media lasts for up to 1 year. It is on sale now with a savings of £3 and is free UK delivery. The best thing about this is it is free! A good walk around the parks or lush forests is always refreshing to both the body and mind. A walk can give you a new sense of direction and gives you grounding that can make you feel less spaced out or too focused about life’s daily problems. Who needs problems? No one likes, neither do I. Walking can also allow our bodies to take a breather from the high-stressed situations that we innundate ourselves on a daily basis. And we need that renewed energy to take a closer look at our lives and the fine details and hopefully learn to welcome our skin afflictions with more understanding instead of fight or flight attitude. Again, this is all about lowering our stress levels in order to permit healing both in the mind and hopefully in the body, as a result. This suggestion is just my own alternative so far. I believe that writing or keeping a journal where you can write your thoughts is therapeutic in many ways. It loosenss up that uptight feeling that you have when you are beset with a skin illness that flares up in all sorts of situations plus compounded by the foods we eat let alone at home and in public places. Writing can also unload the burden of thinking that you have no control over the situation and with this you tend to bottle up all the feelings and negative thoughts that you can associate with suffering from all these skin conditions associated and brought on by a Leaky Gut and eczema, along with all the ‘itching’ and troubled diet choices that one has to face on a daily basis. So try keeping a journal whether it makes a difference or not, it is a good move. It also is one form of distraction to keep you from dwelling on the skin ailment every minute of the day. In fact sometimes I tend to create the ‘itchy’ episodes myself when I gaze at my eczema patches for no reason. I look at it and all of a suddent I start to peel one dry skin after another and the next time I know I have aggravated that part and it is all red and I go ballistic with scracthing and and looking for one dry skin after another until the time that I reach for my cream and sit in silence and feel sorry and big time frustrated about the whole situation.